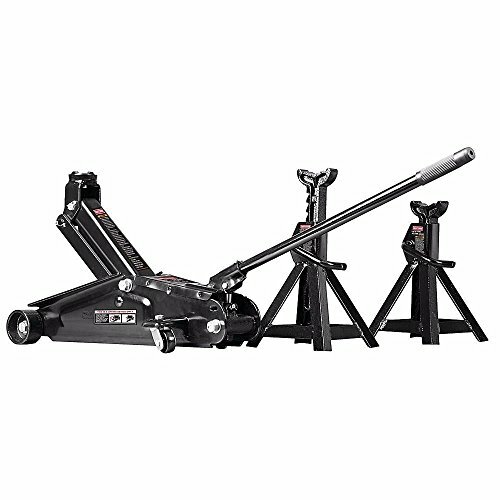 The Craftsman 2-1/4 ton floor jack with jack stands and you'll soon be patting yourself on the back. Perfect for medium and light duty garages, this set hoists up to 4,500 pounds and holds it stock-still, so from fast oil changes to swapping brake pads, tire rotation to coolant flushes, you can get your work done fast and safe. Featuring a lift range from 5-15 inches, everything from minivans, sedans and light trucks are quickly and easily serviced, while the stamped steel, flange reinforced bodies of both jack and stands deliver a stable base you can count on.